Our 3 locations in Las Vegas, Reno & Henderson offers a wide variety of KYND products for our customers. Come by or contact us our knowledgeable staff to help you pick the right one for you. Kynd Cannabis is a premier cultivation and extraction company, specializing in a wide range of high quality recreational and medicinal products. Kynd is a team of seasoned professionals with a combined 70-plus years of experience cultivating and producing marijuana in Nevada. For over a decade, Kynd has been developing highly potent extraction-based strains for medical-card patients with their specific needs in mind. As a whole, Kynd offers CBD and THC dominant strains and carefully crafted hash oil products for Nevada Marijuana brands, edible, recreation and medical. Through reliable cultivation methods, Kynd’s flowers are harvested using time-proven methods and nutrients to produce the optimal product and ensure accurate dosing. Their superior concentrates are developed from Nevada CO2 hash oils to provide a clean and consistent line of products. All cannabis flower and concentrate products go through comprehensive testing by a Certified Ag Lab in Sparks, Nevada. The Dispensary NV carries a variety of Kynd pre-rolls, infused pre-rolls and Indica, Sativa and Hybrid strains. 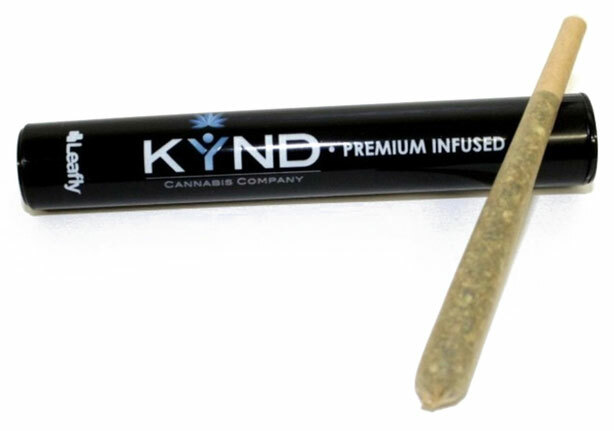 Kynd Premium Infused Pre-Rolls are formulated with their top-shelf bud blended with CO2 oil to provide the user with a powerful experience. Infused pre-rolls are available in Kynd’s most popular strains – THC and CBD strains included. As part of Kynd’s mission to produce only high-quality products, all of their pre-rolls are not made from the shake or sugar leaf. Instead, they are expertly rolled in RAW’s natural cones. They’re individually packaged and heat sealed for the utmost freshness and quality. Their professionalism is also found in their wide variety of 20-plus strains. For those looking for stress relief or even help to sleep, the indica strain will do the trick. Sativa is known for its uplifting properties, helping the consumer to feel more creative and social. The Hybrid provides the best of both worlds and has the most variety of the three. This has both indica and sativa dominant strains to fit the high you’re searching for. Our team of highly trained experts are more than happy to answer any additional questions you may have about the Kynd products. The actual variety and availability will vary from our Las Vegas, Henderson, and Reno locations.